Excellent post, Paul. The area around SLU, with a few exceptions, is lifeless and depressing. There's no reason that Grand Blvd- once the busiest street in the entire city- should not be vibrant with pedestrian activity. Midtown is literally the center of the city, connecting downtown to the CWE and the North Side to the South Side. There is a built-in student population, a huge employment base and plenty of transit connections. Yet, on an average day, you can practically see tumbleweeds. Hardly any retail, and aside from special events, empty sidewalks. The "Center of Art & Life" is a civic embarrassment. In contrast, the areas around Wash. U are among the most desirable in the region. Love it or hate it, The Loop is the most bustling district in the entire metropolitan area, and the neighborhoods of Skinker-DeBaliviere, U. City and Clayton are pleasant, historic and walkable. It's the fortress mentality taken by SLU after it took the "most dangerous campus in America" label back in the early 90's too personally. Ouch! What a post, and good comments. I moved away soon after finishing at Wash U and regretted it immediately. I do feel a long-distance bond with the city, although it's mostly U City, not St Louis proper, filling my memory bank. 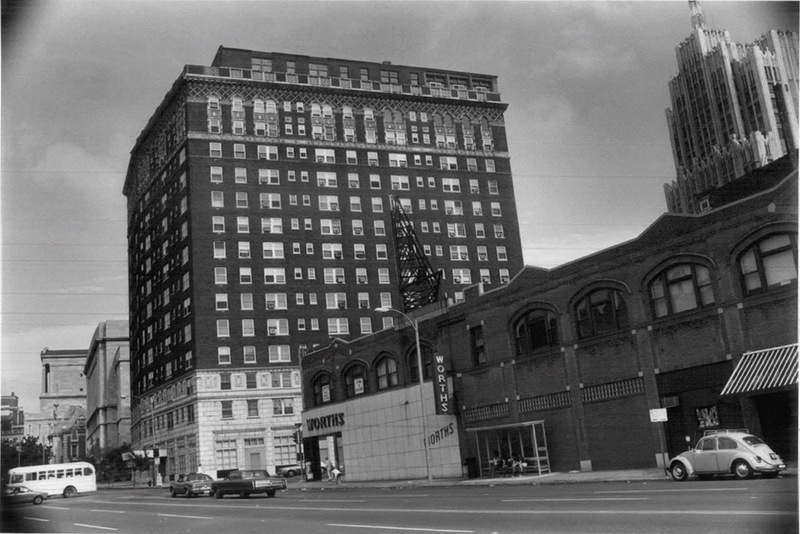 Sodality Hall, which once stood on Grand, just north of Laclede, was another great looking building that SLU tore down. Ok Mike-- stop the Washu Lovefest. I think SLu had a little further to go dont you? Look I think WASHU does a good job dont get me wrong-- and I think Fr. B shouldnt have torn down some of the stuff he has-- but as someone who has seen both-- SLU has come a long long way with much less help and much less to work with. If I were to critique them its just that they are much more insular w development than WU. The other issue is that SLU is very protective of this property and it really inhibits the westward expansion of downtown and mid-town. Attempts to buy land for commercial/residential use have often been denied by SLU, for no other reason than to hold onto the property it holds. It's really akin to McKee's northside project. SLU has been securing a large swath of land and, while McKee has allowed the architecture to dilapidate, SLU is simply tearing it down. So what's worse -- buying up land (covertly) and having a plan for its use, as McKee seemingly does, or buying up land, removing its built-assets and refusing to develop? I love the SLU campus in parts, but on the whole, they either need to build on that land they've acquired or open it up for outside development (of course they'd have a say in what goes through). SLU is our closest thing to a downtown campus and I think all parties would benefit if it allowed itself to be apart of downtown rather than building boundaries. Yes, the WU building at Skinker is gentrification, but most of it was empty. 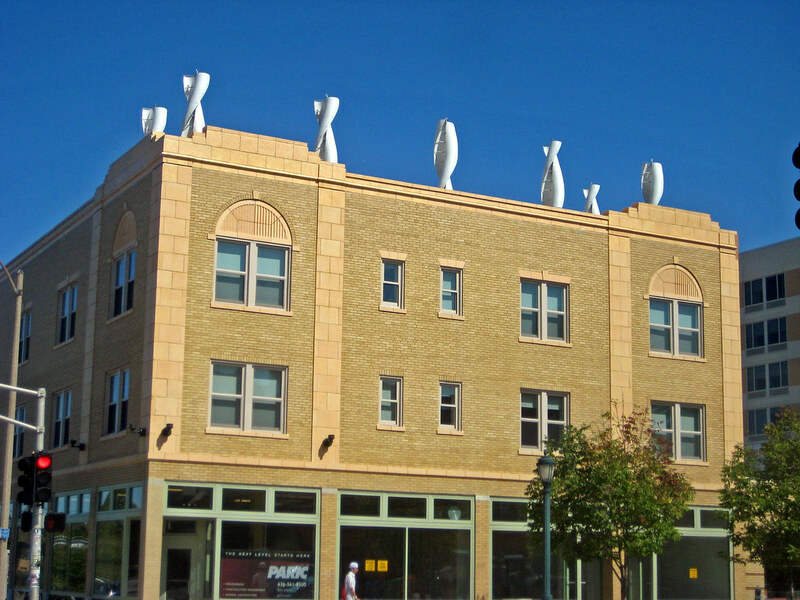 WU did kick out a cute cake shop in the one story building to the north and tried to tear it down for parking, to which we in SD said Hell NO... so they are far from perfect neighbors. Overall though the have for years invested in the community, usually with decent results, whereas SLU buys its surroundings and levels it. Look at the west side of Compton of Chouteau! I agree Grand Center has been very slow to do much, but having SLU try to keep their students in the fenced compound to the south does not help. How much of WashU's land use is determined by high property values in the surrounding neighborhoods? How much is SLU's land use determined by the relatively low property values in the surrounding neighborhoods? I would like to note that not 10 years ago the stretch of Skinker between Forsyth and Forest Park Parkway was a HUGE surface parking lot that rivaled a Walmart parking lot in terms of size and attractiveness. It has been whittled down over time by an art museum and new class buildings (it takes time and donors with very big pockets), but still no single surface lot on SLU's campus matches the size of that lot. You imply that SLU's efforts are driving students to leave the area, I would like to see a comparison of student retention to the region and the city of St. Louis proper. 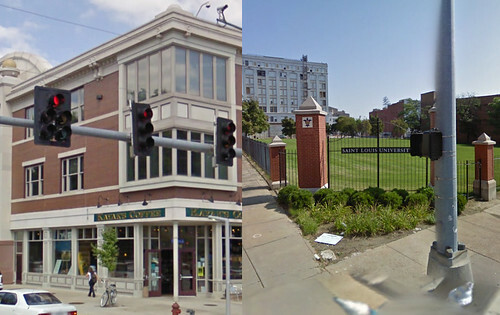 SLU helped devalue the area while Wash U did the opposite. 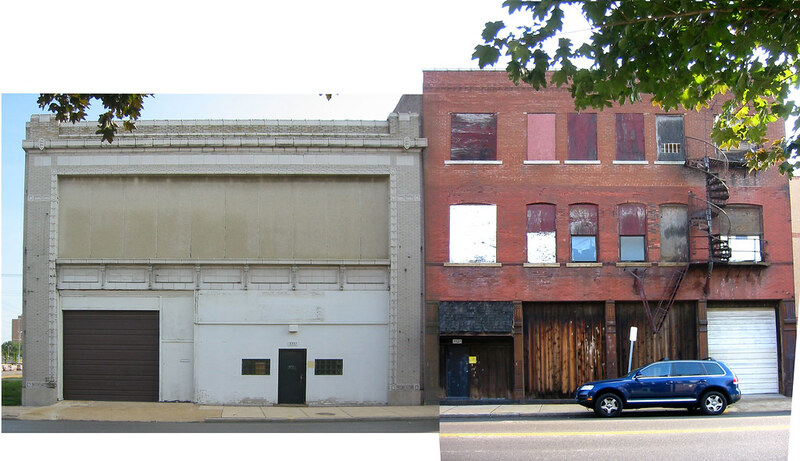 I admit that I would rather have gentrification over demolition, as at least we could address one with public policy. SLU is surrounded by blight and Wash U is surrounded by some of the highest property values in the area. Comparing the two schools without recognizing this key fact is an exercise in futility. Don't forget that the blog's author sits on the Skinker Debalivere Community Council board and enjoys tooting his own horn. SLU might not be visibly keeping those college students in town when you look at the cityscape, but it is when you speak to the alumni. Anonymous: Actually I have not been a member of the Community Council for several years. If you didn't post anonymously and actually spoke to be in person, you would see that while yes, I am opinionated, I really don't have a big ego, so I'm not sure where the "tooting his own horn" thing comes from. Can you really compare two universities' surroundings and the impact on the community like SLU and WashU? WashU isn't even in the city of St. Louis except for about 3.5 buildings. SLU is surrounded by dilapidated buildings that have no structural or monetary value, while WashU has Clayton and the Loop within walking distance. It is obvious that two different strategies will emerge. have you touched on SLU's community outreach like Casa De Salud, Campus Kitchen, or Make A Difference Day, all of which seek to better the city of St. Louis and serve underserved areas of the city? I am a SLU student from northern Colorado and the St. Louis that SLU showed me is the reason I will be staying here next year after I graduate. I could have gone to any college in the suburbs like WashU and moved home, but I'll be here! I'm committed to this city, and that's what SLU teaches. All of my friends from WashU are looking for jobs in NYC or the East Coast. They're obviously really interested in helping promote this city.